Ptuj, an ancient Roman settlement in Slovenia | What's Happening? Ptuj is the oldest city in Slovenia. Its foundations can be traced back to the Stone Age, but the town is generally know as a Roman settlement. The old part of the town indeed looks ancient Roman, with its houses consisting of typical white stone walls and red-brownish roofs. The municipality town currently has about 24000 inhabitants, but when you speak of Ptuj, you basically refer to the older part of the city, which is actually very small. The fact that it’s a somewhat small town doesn’t mean that it’s boring. In fact it’s one of the cuter places that I’ve been to. The more I visit it, the more I like it and the more I discover. You could say that Ptuj is still the old Roman settlement it used to be 2000 years ago. The streets take you back to Roman and Medieval life and bustling trade and it’s easy to imagine carts full of crops and pottery riding down the streets and the squares and open areas being noisy marketplaces, children running around getting candy from the old lady sitting in front of her house. The center of Ptuj is encircled by a road of asphalt, but inside that the streets are made of stones as we know them from old-time movies and it’s hard for cars to get in. In fact, there are a couple of obstructions throughout the centre, and only delivery services and inhabitants can enter. Not that cars would get very far, since a lot of streets are too narrow for cars to go through. The whole town breathes antique history and peace. Without cars, the centre is actually very quiet and safe for people to walk anywhere. You can still find a hairdresser, a bakery, clothe stores, flower shops, anything you need; just not fifty of each, like you would in bigger cities. The central market is a small square with a couple of terraces and restaurants, a peaceful place to sit down and have lunch, and process all the history that’s just entered your mind. 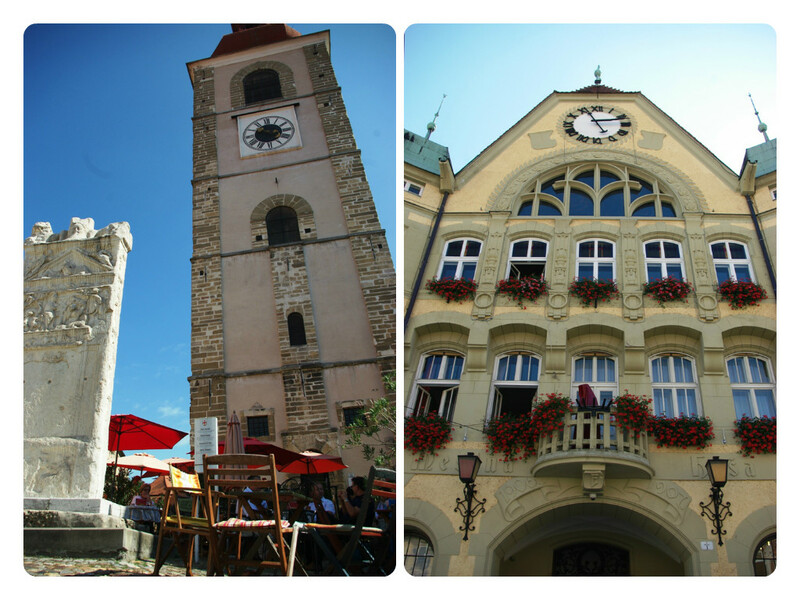 Ptuj is not necessarily a place where you go to for entertainment and fastfood-cinema-rushhour pleasure. It’s the kind of place where you go for something more relaxing and still fun to walk through. In this place it’s more about the little things. One of the relatively many triangular ‘squares’ with a clock tower or former temple or church, a very narrow winding semi-paved path going up- and downhill, or yet another dead end….of which there are so many that nowadays it makes me smile when I walk into one. If you’re looking for something ‘to do’, do not despair: Ptuj has a beautiful and gracious castle, that can sometimes already be seen from a distance of 25 km from Ptuj; from anywhere but Ptuj itself. It’s towering high above the city, but because most of the streets are quite narrow, it can be hard to spot it from within the centre. In the castle there are activities sometimes, and if not, it’s still a must to visit, because from up there the most amazing views can be seen, looking out over the Slovenian countryside and the river, that runs alongside Ptuj. It’s hard to describe in words: it’s beauty that speaks for itself. The centre of Ptuj and the outer parts of the town are on one side separated by a river. There are a couple of bridges over it, of which one is for pedestrians only. This makes it extremely valuable and nice place to take a break, take a breath and look out over the flowing water and up to the castle. I often just sit down here and absorb the remarkable peace that surrounds Ptuj. Only pedestrians, sometimes a bike passing, and cars all the way over at the other bridge. Close to this bridge there’s small park, in case you’re on a peace and fresh air tour. It’s situated alongside the river, which makes it a perfect place sit down and eat your sandwich while listening to the soft rumbling of the river and looking up to the sky that, if it’s not completely sunny or overcast, always has some weird and amazing cloud-game going on, which is so typical for Slovenia in general. If your kids need a break, this park is the perfect place to go, with a couple of benches and a playground. And if you didn’t make your own sandwiches, restaurant Pomaranca is where you have to go. Coming from Ptuj’s centre it’s almost right across the central bridge, you can’t miss it. And everyone knows the place and can point you the way, in case you don’t speak Slovene or the person doesn’t speak your language. They have amazing pizzas, oven-baked according to Slovenian standards, which makes the pizzas ever so delicious and even for a haute-cuisine person like me something I wake up for. Not to mention the amount of stuff they put on them. Good luck finishing it. Next to this and their ‘normal’ menu, they got daily offers for only 5 euros, which are big plates served with soup, salad and bread. And be sure to as around for the MuziKafe, a nice calm place that serves as a bar, and cultural centre, with a lot of concerts and artsy nights. Do yourself a favour and visit this town called Ptuj. Being a foreigner myself I’m speaking to you in all honesty and I can say that there’s so much more to this town than just its quietness and seeming nothing-going-on-ness. I dare say it’s very different from most of the cities you already know. http://www.diegomallien.com/travelling-and-culture/ptuj-ancient-roman-settlement-slovenia/http://www.diegomallien.com/wp-content/uploads/2017/03/20141223_150921-1024x614.jpghttp://www.diegomallien.com/wp-content/uploads/2017/03/20141223_150921-150x150.jpg 2017-03-31T11:25:27+00:00 Diederik MallienTravelling and CultureThe first-built city that's been preserved and developed is a Roman settlement Ptuj is the oldest city in Slovenia. Its foundations can be traced back to the Stone Age, but the town is generally know as a Roman settlement. The old part of the town indeed looks ancient Roman, with...Diederik Mallien malliendk@gmail.comAdministratorWhat's Happening?